On Oct. 29, the Houston Texans lost to the Seattle Seahawks, 41-38, a hard-fought game in which rookie QB Deshaun Watson put on an entertaining, four-touchdown, 403-yard performance. Houston was 3-4 but still sat at the edge of the playoff hunt in a weak conference, and Watson had led the offense to close games against competitive teams since taking over the top quarterbacking job at halftime of the season opener from immobile stopgap veteran Tom Savage. Four days later, Watson tore his ACL in practice. With the injury, the Texans and head coach Bill O’Brien found themselves at a crossroads: Would they return to Savage, or try to find the best quarterback available? Instead, Houston went with a third and fourth option. On Nov. 3, the team brought in not one but two quarterbacks, T.J. Yates and Matt McGloin. When training camps opened this season without Colin Kaepernick getting a single job offer, a certain tribe of football experts and anonymous front-office sources defended his ongoing unemployment by arguing that he was not good enough to crack an NFL roster—despite a 59.8 completion percentage, 72 career passing touchdowns against 30 interceptions, 13 more touchdowns rushing, and a Super Bowl appearance. The question was whether teams would stick to that stance even as the pool of quarterbacks went through failure and injury attrition. The Texans stuck with it. Yates had 227 pass attempts, a 58.1 completion percentage, and six passing touchdowns to eight interceptions in his first six seasons in the NFL—but four of those seasons were in a Texans uniform, and he’d even started a 2011 playoff game (completing 11 passes against the Bengals in a 31-10 victory). McGloin, in four seasons with the Raiders, had 277 pass attempts, a 58.1 completion percentage, and 11 passing TDs to 11 picks—but O’Brien had coached him at Penn State. Familiarity, albeit familiar mediocrity, won out. At least for a moment. Four days after these signings, the Texans released McGloin for Josh Johnson, who hadn’t thrown a pass in a regular-season game since he was with the Buccaneers in 2011. Savage reclaimed his starting gig by default. Over his next five starts, he threw for five touchdowns and six interceptions, completing 56.5 percent of his passes. The Texans went 1-4. Savage was thoroughly annihilated by Elvis Dumervil and twitched on the ground in Week 14, against the 49ers. Somehow, he was allowed to return to the game for a few more plays before Yates appeared in his stead. Yates contributed 175 yards and two TDs as the Texans finished up a 26-16 loss, giving San Francisco their third win of the season. “I will never quit as the head football coach of the Houston Texans - ever,” [O’Brien] said. The Texans’ season was probably beyond any one person’s power to save. 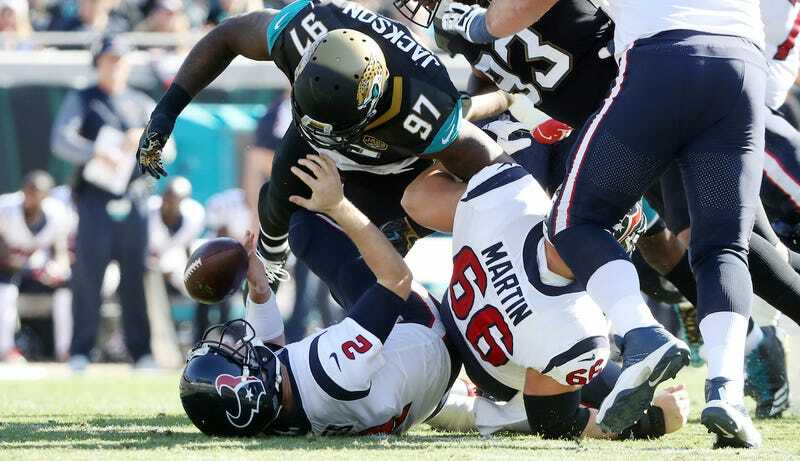 Beyond Watson, the Texans lost players on offense such as left tackle Chris Clark, running back D’Onta Foreman, receiver Bruce Ellington, tight end Ryan Griffin, and tight end C.J. Fiedorowicz, among others. Colin Kaepernick wouldn’t have healed those injuries or otherwise guaranteed improvement. But given Houston’s quarterback decisions, and the results the Texans got from them, it had to have been worth a shot.